Nestled in the very heart of Barcelona, a stone’s throw from Las Ramblas and Liceu Opera House lies the Liceu Loft Apartment. A compact and cosy top-floor apartment for 4 with a fantastic terrace to lounge on in front of the evening sun. The Liceu Loft apartment is part of a recently restored building, and it is the sister apartment to the Liceu A and B apartments located in the same building. The entire building is dedicated to accommodate guests and has been fully redecorated maintaining and improving the ancient façade. The interior decoration is modern and exquisitely refined with a personalized chic and basic touch that creates a stylish ambience with all the mod cons you need. To find out more about the Liceu Loft Apartment Barcelona, Click here. 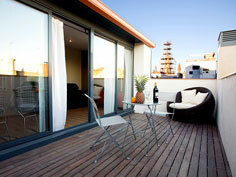 To find more Barcelona apartments, Click Here.